During a one-year study period, 4,822 people were treated in emergency rooms due to floor jack failure. Isn’t that reason enough for every home mechanic to get the best jack stands they can afford? When you shop for jack stands, you need to look at a few things… weight capacity for a set of two, the range of adjustable height, base width for how much room you have, and how the adjusting mechanism works. Ratcheting stands tend to be more convenient, but selecting a pair of stands which use pin and hole, or pin through, technology will give you the highest safety rating. Keep in mind that a pair of stands only supports a portion of the weight of the vehicle, so a 3-ton pair is sufficient for almost any personal vehicle on the market. Sure you can get a set of 6-ton jack stands, but in most cases, you’re just wasting money on a heavier, bulkier product. Key factors for you to consider are the durability of the product and the manufacturing quality. The base can be made from aluminum, but look for steel pins or ratcheting devices which will be able to handle years of wear without bending or breaking. To make it easier for you to get the best value for your money, here are three top-rated jack stands that have been selected for their overall ranking and user satisfaction. Make sure to pair them with a good quality floor jack to be able to get the stands underneath. Where Do I Put Jack Stands Under the Car? What Weight Jack Stands Do I Need? How High Can Jack Stands Go? Jack Stands vs Ramps – Which is Safer? 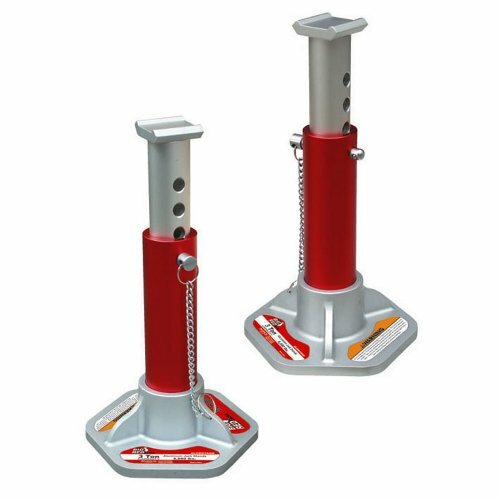 The aluminum frame of these excellent jack stands is extremely lightweight, giving you maneuverability in confined locations. Plus, aluminum construction is rust-free so you won’t have a problem with the stand becoming stuck or difficult to operate. You will appreciate the pin through design because it’s safer and more dependable than a ratchet model, eliminating the fear of the stand slipping or dropping on you. For additional safety, the top is large enough to fit securely under the frame of a car. Designed to use as a complementary device with your vehicle jack, the Torin T43004 will slide in next to the jack for use in an adjacent jack point. Many jack stands have a pyramid-shaped base, but not the T43004. Instead, it is designed to resemble a traditional piston-operated hydraulic jack, including a large aluminum base. An added benefit is the flat bottom which better distributes the weight on your garage floor as opposed to the traditional 4-leg design which has a better chance of making your perfect garage floor not-so-perfect. The base is rust and corrosion free, and the pillar design means that you can position this jack stand more easily under the car. Lift height ranges from 10-3/4″ all the way up to 15-5/8″. Technically, if you don’t insert the pin in the top hole, the minimum height is only 9-7/8″. That makes these stands perfect for cars with a low clearance. Lighter and easier to use, these jack stands require half as much space for storage when you’re not using them and are a favorite of track and autocross drivers. One downside is the limited height so those with trucks or SUVs may want to consider a set with a higher range such as the Hein Werner set below. Also, it’s hard to get over the fact that these will hold up your vehicle since most of us are used to the traditional pyramid shaped stands but they definitely will as they’ve been a best seller for years. The Torin T43002A jack stands offer the more traditional stand design and come at a very affordable cost. Available in 2-ton, 3-ton, and 6-ton variety, they have a unique double locking pin design for peace of mind, but can be ratcheted for adjustment once put in place. You have plenty of room for height adjustment, ranging from 11 1/2 up to a maximum of 16 inches. The wide lifting range provides you with more clearance and better overall support. There’s even an SUV/extended height version which goes up to 20.5″ if needed. With a 6.5″ x 7.25″ base, these stands have a good solid footprint while fitting in spots without much issue. Solid construction, strong (but slightly messy) welds, and a uniquely designed support head make the highly regarded Torin T43002A a great value. If you’re looking for a product that’s made in the USA, the Hein-Werner HW93503 is just what you’re after. With a rated capacity of 3 tons per pair, this model is designed for intermediate weights, but sturdy enough to handle almost all home applications. The top center design is curved for stability under the frame and the bottom of the stand includes triangular reinforcing the make it more stable on pavement of other surfaces which have a tendency to give under pressure. 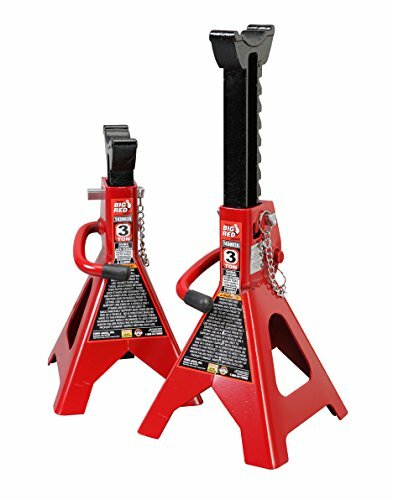 Having one of the widest bases for a 3-ton jack stand at 7.5″ x 9″ means they’re incredibly sturdy but may not fit in some tight spaces. You’ll also like the adjustable ratchet design the gives you a clearance range between 12 and 19 inches which is 3 inches higher than the competitors on this page. While you’ll pay a little extra for Hein-Werner build quality, most will tell you it’s definitely worth it. It’s very important that you do not place jack stands in just any location under your car. You will need to jack up your car from a jack point under the cabin. Jack points are dedicated areas, for jacks and stands, that manufacturers place on vehicles so that owners can have a safe non-slip location to support the car from. Jack points are usually located near the front and rear wheels, but their exact locations vary with each vehicle. The way to best locate the jack points of your vehicle is to check the owner’s manual. You don’t need to go overboard when you are purchasing a jack stand for your car; there is no need to get a 12 ton jack stand set when your car only weighs 2300 pounds. The weight rating on a jack stand is “per pair”. 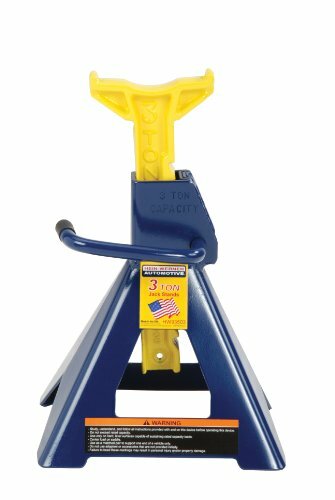 So if you have a pair of 2-ton jack stands, each stand is rated to support 1,000 pounds. You also need to keep in mind that “most” vehicles are heavier in the front where the engine is, so if you’re lifting up a front corner of a 4,000 pound car, that front corner probably weighs more than 1,000 pounds. As a general rule, f you have a compact car (Ford Fiesta, Mazda 3, Honda Civic, etc. ), 2-ton jack stands would be fine. For mid to full size sedans, minivans, Jeeps, and small trucks and SUVs, 3-ton stands will typically be best. For large trucks and SUVs, you may want to go with 6-ton jack stands. Jack stands can certainly fail; which is why it is important that you utilize multiple jack stands when lifting your car. Despite their large carrying capacities, jack stands are much smaller and lighter than vehicles. Jack stands are designed not to fail under loading, but there are occasional cases where jack stands have broken or bent; lowering a car unintentionally. Due to the various mechanisms that jack stands utilize in order to lift tons of weight, there are multiple parts that can fatigue or get damaged over time. 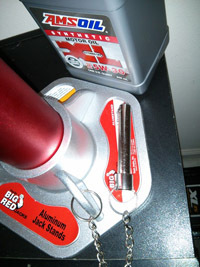 There are a variety of jack stands on the market, for vehicles with a variety of heights. Vehicles as tall as lifted trucks need to be supported by jack stands at some point. Jack stands are available in heights as low as 13 inches to as high as 72 inches. Some vehicles will need taller jack stands to accommodate the larger amount of ground clearance that they have. Due to their wider bases and larger surface areas, ramps are much safer than jack stands if used correctly. Jack stands use mechanisms to prevent stand failures, but these mechanisms can fail unexpectedly. Ramps do not need mechanisms to hold a vehicle up, the platform and design of the ramp allows them to easily hold a vehicle’s weight. Ramps, unlike jack stands, are more intuitive to use and do not necessarily require an instruction manual; though you should still read it if your ramp comes with one. Though ramps are safer than jack stands, ramps do not allow for users to perform any suspension repairs without the use of another object to hold up the car. Jack stands and ramps both have their uses and are tools that every home mechanic should have. Which ASME standard do these comply with? The latest I know is ASME PALD-2009 implemented on 05/21/2011 which required overload to be increased like from 150 to 200%. Torin T43004: Doesn’t appear to comply with ASME standards but these are not really intended for commercial use. How can you tell if the weld is “bad” and unsafe, or just “bad” and cosmetically unappealing? I have purchased the Torin T46002A (6 ton) and the welds on both look “bad”, but I’m not a welder, so I can only comment on how they look. Do jack stands fail due to bad welds? The quality of the weld on a jack stand that serves to connect the top piece to the base isn’t actually super critical since the weld itself is not holding up the weight of the car. It’s more aesthetics and not really anything to worry about when you stick to well known brands. Some just looker cleaner than others. Hi there! Was just wondering which of these would would recommend for longterm reliability and strength? All are reliable and strong but if I had to pick a set, I’d go with the Hein Werners. They have the widest base (7.5″ x 9″) of the three and are slightly heavier than the Torins. That said, if you’re tight on space, they might not be the best option. I don’t know. The Torins look like they would tip over easily. I thought that as well the first time I saw a picture of them. But in reality, the base is about 7×7 inches and they feel just as solid under load as the typical cone shaped stands. A big benefit is they fit much better in tight spots.